I’ve owned my Breville Tea Maker for roughly 3 years now, and I can say that I use it more than anything else in my kitchen. It is more specifically called Breville the Tea Maker. It is model number BTM800XL. It may have once been called the Breville Stainless One-Touch Tea Maker. I use it on a daily basis to brew and re-brew many types of loose leaf tea, depending on what I am in the mood for. Normally, the price is roughly $250, but Teavana was having a 20% off sale, so I was able to pay $200. After learning more and more about proper brewing methods for loose leaf tea, you really do need to brew tea at the proper temperature to avoid burning the leaves and to release the most flavor. The Breville Tea Maker provides preset brewing temperatures for green, white, oolong, herbal, and black tea, along with custom buttons to change the temperature and brewing time to make the perfect cup of tea. Most packages of loose leaf tea should tell you the proper settings to brew the tea. Check out the Breville Tea Maker on Amazon. I have been a little slack with cleaning it, since I am normally good with not letting any excess tea stand overnight and with discarding the leaves from its basket. I did once do a thorough cleaning with lemons as recommended to remove any build up of tannin. It does take a little effort to discard all of the leaves from the basket, and I usually run it under water and spray it a number of times to remove the smaller leaves. All in all, cleaning the Breville Tea Maker is pretty simple. The Breville Tea Maker is really easy to use after a few times. You just fill the jug up with your desired amount of water, fill the basket with the proper amount of tea leaves and replace its lid, place the basket back on the magnetic portion of the glass jug, select your tea type and strength, and then hit the Tea/Cancel button to start the brewing. I usually make about two cups for myself at a time, and then hit the Keep Warm button for my second cup. If you do have a lot of guests, you can make about 5 cups at a time and even use the Basket button to have the tea basket automatically lift up and down during brewing for more infusion and flavor. I do not normally use this function for 2 cups since there is less water and the basket ends up being removed from the water briefly. You can also use it to simply warm hot water for any number of uses such as making hot chocolate, soup, noodles, etc. Although I never use this function, the Breville Tea Maker can also be set to brew tea at a programmed time, so you could hypothetically wake up to a perfectly brewed cup of tea. One strange part of the tea maker is that there is no On/Off switch, so I usually just unplug it at some point after brewing is complete. Another issue is that the brew temperature is normally within increments of 5 degrees beginning at 160 degrees, but does allow you to brew at 212 degrees. 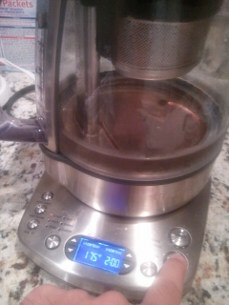 As a result, I have one tea that I am supposed to brew at 208 degrees, but cannot do so, so I stick with 205 degrees. There are a number of warnings that must be followed such as not immersing or washing the glass jug under running water. Do not get overwhelmed by the instruction manual because the tea maker is really simple to use. I would recommend the Breville Tea Maker to anyone for themselves or as a gift. Usually you can find a Breville Tea Maker in the $220 range, and a used one in the $170 range. The timer that counts up after your tea is finished brewing costs maybe 10 cents a year in electricity, so there’s no need for an on/off switch. But, if you’re really that concerned about it, just hit the Cancel button (same button as the Tea button), and the display will shut off automatically after about 1 minute.